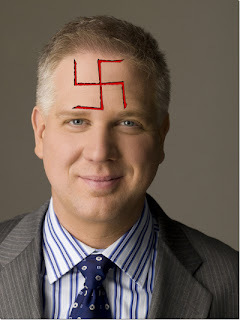 Taking a break from the British UKIP racist clowns, let's focus on USA based anti Semitism in the person of Glenn Beck. Television and radio host Glenn Beck warned NRA members that the "freedom of all mankind is at stake" and the "right to keep and bear arms shall not be infringed." 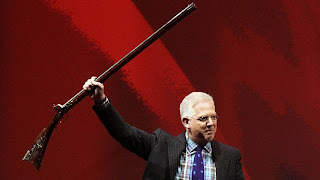 We agree with Beck about one thing: the freedom of mankind is at stake, but not because of "gun control" so much as Beck new racist friends he's playing to in the Libertarian base. Beck said on the radio this week that Soros — as a 13-year-old Jewish boy living apart from his parents in Hungary — "used to go around with this anti-Semite and deliver papers to the Jews and confiscate their property and then ship them off. … It was frightening. Here's a Jewish boy helping send the Jews to the death camps." Beck continued, "I am certainly not saying that George Soros enjoyed that, even had a choice. I mean, he's 14 years old. He was surviving. So I'm not making a judgment. That's between him and God." Abraham H. Foxman, national director of the Anti-Defamation League called Beck's comments inaccurate, "completely inappropriate, offensive and over the top." He added, "To hold a young boy responsible for what was going on around him during the Holocaust as part of a larger effort to denigrate the man is repugnant." Beck’s implication is that there was something sinister in Soros’ support for anti-communist civil society organizations in the former Soviet Union. Further, he sees such support as evidence that Soros will engineer a communist coup here in the United States. This kind of thinking only makes sense within the conspiratorial mind-set of classic anti-Semitism, in which Jews threaten all governments equally. And as a wealthy Jew with a distinct Eastern European accent, Soros is a perfect target for such theories. To inoculate himself against charges of anti-Semitism, Beck hurled them at Soros, pointing out that he’s an atheist and a critic of Israel. He accused Soros of helping Nazis steal Jewish property as a teenager and of feeling no remorse about it. In fact, when Soros was 14 in Nazi-occupied Hungary, his father bribed an agriculture official to pretend that the boy was his Christian godson. Soros once had to accompany his protector to inventory a confiscated Jewish estate. Asked by 60 Minutes if he felt guilty about it, he said no, because he wasn’t at fault. The slander that he was a Nazi collaborator has proliferated on the right ever since. The Anti-Defamation League’s Abe Foxman said in a statement sent to Salon today that he still believes Fox host Glenn Beck “is a strong supporter of Israel and the Jewish people,” even in the wake of a week of conspiratorial attacks on George Soros that some saw as anti-Semitic. “But I also believe that there are certain things he doesn’t understand, which have led him to make insensitive remarks,” Foxman continued. Anti-Semitism is suspicion of, hatred toward, or discrimination against Jews for reasons connected to their Jewish heritage. The term was coined by non-Jews in late 19th century Europe as a more scientific-sounding term for Judenhass ("Jew-hatred"). In recent years, as the libertarian movement has grown, so has the anti-Jewish movement within this clan of activists supposedly concerned with promoting liberty and freedom for all of humanity. The word libertarian comes from the root word "liberty" and refers to individuals who favor less government intrusion and are distrusting of government power. In the U.S., the libertarian movement, broadly speaking, consists of think-tanks, Ron Paul activists and organizations, and those affiliated with the Libertarian Party. 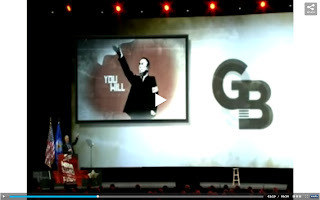 Ron Paul, the once and future Republican presidential candidate and cult-hero among Libertarians, has a long and disturbing history of racialism and anti-Semitism. In 1991, a Paul-controlled newsletter praised ex-Ku Klux Klan leader David Duke. “Duke lost the [Senate] election [in Louisiana], but he scared the blazes out of the Establishment,” it stated. Paul also has expressed hostility toward the Jews. According to the Philadelphia Jewish Voice, Paul refused to return a campaign contribution in 2008 from white supremacist and notorious anti-Semite Don Black. Paul has reportedly called Israel “evil” and has alleged that the Mossad, the Israeli intelligence agency, might have blown up the World Trade Center in 1993. In 1987, an edition of Paul's Investment Letter described Israel as an aggressive, national socialist state. ......Some Paul supporters acknowledge the newsletters but dismiss them as “old news,” arguing that there is no trace of the racist and conspiratorial ideas he promoted for decades in his speeches today on the campaign trail. But while it’s true that Paul has not said anything explicitly racist in public, the same cannot be said for his promotion of conspiracy theories. He appears regularly on the radio program of Alex Jones, perhaps the most popular conspiracy theorist in America (profiled by TNR in 2009), where he often indulges the host’s delusional ravings about the coming “New World Order.” He continues to associate with the John Birch Society, the extreme-right wing organization that William F. Buckley denounced in the early 1960’s after it alleged that none other than President Dwight D. Eisenhower was a “dedicated, conscious agent of the Communist conspiracy.” Asked about the group in 2007, Paul told the New York Times, “Oh, my goodness, the John Birch Society! Is that bad? I have a lot of friends in the John Birch Society.” Indeed, Paul delivered the keynote address at the organization’s 50th anniversary dinner in September. In spite of a "rocky history" with Ron Paul supporters, they and Beck seem to have "made up", assuming they were ever really at odds. It was a good run Mr. Beck. You swindled people's perceptions and manipulated opinions for a three long years. But now your Nazi colors are bleeding through. "Push Nazi propaganda, you're a Nazi. Your friends are Nazis, you're Nazi. Make excuses for Nazi propaganda, you're a Nazi. 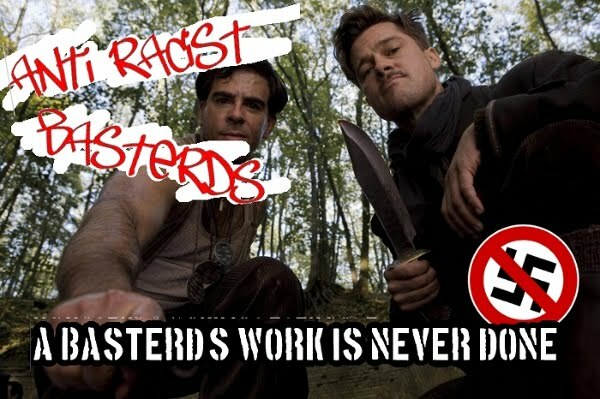 Organize on email lists or websites with Nazis or Nazi propaganda, and don't call it out, you're a Nazi." Hope that works out for you and your new/old Libertarian pals.